I give you GEO (1989-97). Over 9 model years, GEO padded Chevrolet dealerships with nothing but rebadged cars from 3 different companies: Toyota (Prizm), Isuzu (Spectrum and Storm), and Suzuki (Metro and Tracker). 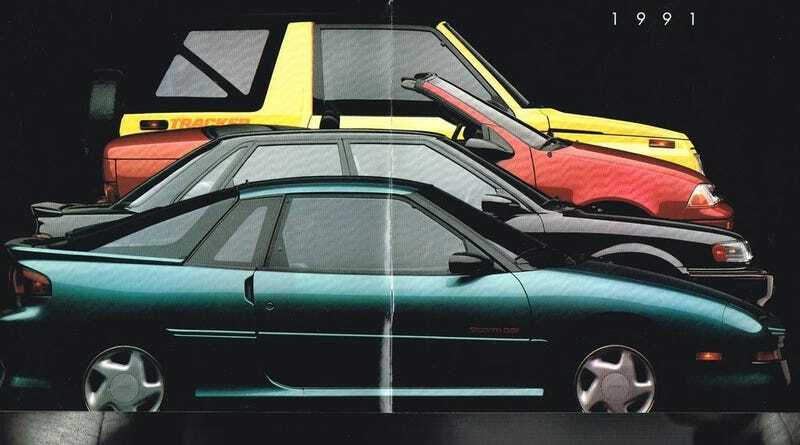 Then there was Chrysler’s Eagle division (1988-98). In its 11 model years, Eagle sourced its cars from 3 different companies besides its Chrysler parent: AMC (Eagle wagon), Renault (Medallion and Premier), Mitsubishi (Summit/Vista, 2000GTX, and Talon), and only offered one Chrysler-designed model (Vision) in its entire existence. And then there was Isuzu (1981-09). While the brand was closely tied to GM by the 1970s, giving Chevy the LUV and Buick the Opel-Isuzu, by 1981, the brand ventured out on its own in the US market as GM withdrew their rebadged versions of Isuzu’s cars - temporarily. Isuzu made its name with trucks and SUVs, and gave up on cars entirely in the US market by the mid-90s. Then the economy crashed in Japan and Isuzu started to lose interest. By 1997, the 4 models they offered in the US were the rebadged Honda Odyssey (Oasis), the rebadged Chevy S-10 (Hombre), and the Rodeo and Trooper, which were themselves rebadged by Honda as the Passport and Acura SLX. Their JDM passenger car models were simply rebadged Civics and Accords. Isuzu tried to reestablish its identity by 2000-02 with radical-looking (but still Rodeo/Trooper-based) VehiCrosses and Axioms. But they and the later direct-injected V6s failed to move the needle and Isuzu wound up in rebadge oblivion having sold Colorado-based i-Series trucks and Envoy-based Ascenders to almost no one until the end came quietly in 2009. They all proved that you can’t just cobble together other companies’ wide range of unrelated designs and expect your brand to mean anything to people. What’s your favorite line of cobbled together outsourced rebadges?